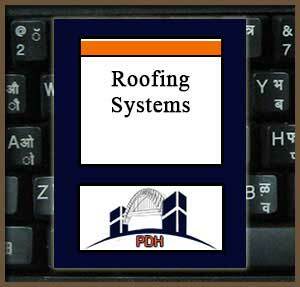 This is an introduction to roofing systems. You will learn how to specify roofing systems and incorporate appropriate engineering details into your working drawings on a wide variety of projects. You will learn about the different types of roofing systems for steep- and low-slope roofs, considerations when selecting a system, re-roofing and re-covering issues, design considerations, and typical details. This course will allow you to address roofing system issues on all types of commercial, industrial and residential buildings. This course will give engineers and others an understanding of the basic types of roofing systems that can be used on commercial, industrial, institutional and residential building projects. For engineers and construction professionals needing an introduction to the basic types of roofing systems, this course will tell you how to evaluate different systems for specific projects, how to specify and detail roofing systems, and important maintenance considerations. Learn about the different roofing systems that can be used on steep-slope roofs. Learn about the different roofing systems that can be used on low-slope roofs. Learn how to select roofing systems based on use criteria. Learn about environmental considerations when specifying roofing systems. Learn about typical design details you should use with different roofing systems. Learn how different roofing systems perform when exposed to wind and traffic wear conditions. Learn about the fire resistance characteristics of different roofing systems. Learn about the loads different roofing systems impose on a building structure. Learn how to integrate thermal insulation with the roofing system. Learn about vapor barriers and retarders and when they are used.